You often hear people talk about Rock and Roll Heaven and the fabulous group that must have been formed to include members like Buddy Holly, Janis Joplin, Elvis Presley, Jimi Hendrix, John Bonham and so on. But there's another celestial group whose membership increased this week...Fast Food Heaven! 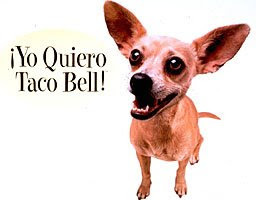 Gidget, a 15 year old female chihuahua was the pitchman, er, ah, pitchdog for Taco Bell until a stroke put a permanent end to her advertising career - an effect eerily similar to the one might get from the product she pitched. But health concerns aside, she becomes the latest member of that great fast food restaurant in the sky. 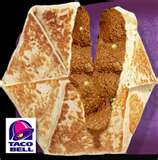 It's no wonder Taco Bell had a dog as a spokesperson. Some of their menu items looked like they came out of the south end of a north-going mutt. But I digress. 15's pretty old in dog years. But she's not the only junk food maven to live to a ripe old age. Other elderly members of this high cholesterol collection include Ray Kroc founder of McDonald's who died in 1984 at the age of 82. He may have had one Big Mac too many. It's a shame he passed away, he deserved a break today. Colonel Harland Sanders, founder of Kentucky Fried Chicken bit the dust in 1980 at the age of 90. He had a secret recipe, that encouraged us all to set the table without silverware because it was finger lickin' good. Dave Thomas found the beef and created Wendy's. He died in 2002 at the age of 69. So maybe there's something to being a junk food junkie after all. Good to know I'll have a choice in the afterlife. Yes, variety is a good thing! Interesting point. Unfortunately, Ronald McDonald is still kicking around. Damn that dude is freaky. And probably a pederast. Wasn't Clara Peller also in the "I've fallen and I can't get up" medical alert bracelet commercial. Or was the the Clap on, clap off commercial. Winky: Yeah but she didn't spend her life eating those hamburgers. She only started doing the ads when she was 81! She died 4 years later. FTU: Yeah, he and Burger King actually scare me. lotgk: Nope, that was someone else. Her claim to fame was "where's the beef". Good try though. Thanks for giving me the craving Noname! Quirks: Ha, ha, Pepsi, Pepsi, Pepsi! 69 is a young age to die, but it's a good number I'd say. Mike: You're right, Dave died relatively young but Clara "where's the beef?" Peller went to the big burger in the sky at 85.